You have found the most popular post of Sjefgardentips. Sjefgardentips is a site with more than 30 unique tips for your vegetable garden. When you are interested in more tips, go to the Home page. This post describes tips for storing the harvest from your garden. And how to ripen sweet peppers and tomatoes. Lay beans in a plastic bowl. Cover them with kitchen paper (absorbing paper). Spray the paper. Put a pan lid on the paper. Place all in the refrigerator. In this way beans do not dry out and low temperature prevents from rotting. Spray the absorbing paper when dry. If you have many beans, lay them in the “vegetable tray” of the refrigerator. Cover them with wetted absorbing paper. A pan lid is not needed when there is a glass plate above the vegetable tray. Spray the absorbing paper when dry. Storage time is about 7 days for beans that were harvested dry and clean. For wet beans (picked after rain) or water rinsed muddy beans, storage time is shorter, about 4 days. Regularly check the beans and the paper. Spray water on the paper when dried up. Remove rotting beans. Remove beans with brown spots or break off brown parts. Instead of moist absorbing paper you can use a moist cotton dish towel or somethong like that. Use a sharp knife to cut the stem under cauliflower “straight + horizontal”. Some leaves remain at the cauliflower. Pour water in the vegetable tray, 0.5 inch high. Place the cauliflower in the tray with the stem below. Put the tray in the refrigerator. If the cauliflower is too big, you can cut it in half and place both halves in the tray as shown at the 3rd photo. In this way cauliflower does not dry out and low temperature prevents from rotting. Shelf life is about 7 days. Check cauliflower and water level regularly. There can be small brown spots on the cauliflower after storage. Just cut these spots before using the cauliflower. Remove some leaves. Cut the stem of the broccoli “straight + horizontal”. Pour water in the vegetable tray, 0.5 inch high. Place the broccoli in the tray with the stem below. In this way broccoli does not dry out and low temperature prevents from rotting. Shelf life is about 5 days. Check broccoli condition and water level regularly. When the stem of the broccoli has become soft or brownish during storage, you can cut away a small piece of the stem. In the Netherlands you can buy these low cardboard boxes in a plant shop for €0.19 each. Handle potatoes “like eggs”. Don’t throw but pick up and lay down carefully. This prevents damage and blue spots on potatoes. 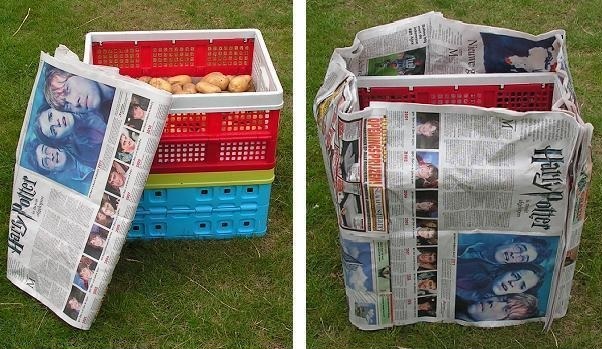 After harvesting let potatoes dry on dry garden soil, on newspapers or on carbord, when needed under a roof. After drying remove adherent garden earth with a soft brush. You can immerse potatoes in water to remove garden earth. That’s no problem for the potatoes. But hereby the potatoes get soaking wet and they need to be dried for a long time before storing in a crate. You can keep the garden earth on the potatoes (and not brush off or wash off). That’s okay when you store the potatoes in a so called potato clamp; a heap of potatoes covered by straw and garden earth. But in a (shopping) crate, dried garden earth falls from the potatoes and forms a layer on the bottom of the crate. Before peeling, you have to remove the clinging earth. That’s not useful; you better brush off the potatoes right after harvesting and drying. Use 2 low, well fitting cardboard boxes. Adapt the cardboard boxes as shown on the photos above. Lay the 2 adapted cardboard boxes in the crate; with the vertical sides of the boxes against the “inner walls” of the crate. When you don’t have well fitting cardboard boxes, use cardboard plate and fold it into the desired shape. The potatoes in the cardboard box lay on softer material than on the bottom of the plastic crate; so less risk of skin damage of the potatoes. The vertical sides of the boxes (and the newspapers around the crate) keep the potatoes dark during storage. Lay potatoes in the crate on the cardboard. You may fill the crate until a few centimeters (1 inch) under the top of the crate. That works well. Let the potatoes dry in the crate for some days. The dryer the potatoes are in the crate, the less chance of rotting potatoes. And one rotting potato does not infect the surrounding potatoes easily. Put the crates with potatoes in a cool room (cellar). Store potatoes in the dark, otherwise they get green. Green parts of a potato are poisonous. Dark storage is possible with loose newspapers laid on the crate and folded over the sides of the crate. But easier is making a “newspaper skirt” and put it around the crates. In tip 2 the making of this skirt is described. Put the newspaper skirt around the crate(s). Lift the skirt around the crates a little and fold the top “to the inside”. Lay a newspaper on top. In this way potatoes are stored airy and dark. The newspapers and the edges of the cardboard boxes retain the surrounding light. But there are many openings to let through air. These photos show how to store potatoes in a small plastic basket. To make the whole light tight, put a piece of folded newspaper at each small side of the basket. Lay potatoes in the basket. Put a piece of newspaper on top of the basket. During storage check the potatoes regularly. After some weeks some potatoes can have a dark colour. See photo above: 4 dark potatoes at the left, and 3 “normal coloured” potatoes at the right. Two “dark coloured potatoes”, each cut in halves. These potatoes have the plant disease “Phytophthora” and must be removed from the storage. Do not put them on your compost container. After 1 to 2 months of storage, first potato shoots can be visible. Sprouts can appear from early September (late summer) on. Regularly check potatoes for rotting and remove shoots. During this action lay checked potatoes in another shopping crate with cardboards in it. So you end up with the empty original storage box. E1) When July and/or August (summer months) were rather dry months. During dry summer months, onions and foliage will dry in or on the garden soil. Harvest the onions when the leaves are brown and (almost) dry. Lay them in cardboard boxes and let them dry for some days. See E3) Storage . E2) When July and/or August (summer months) were months with many rainy days. During a “wet summer”, onions will not dry very fast in or on the garden soil. Gather the onions when leaves have been fallen down. 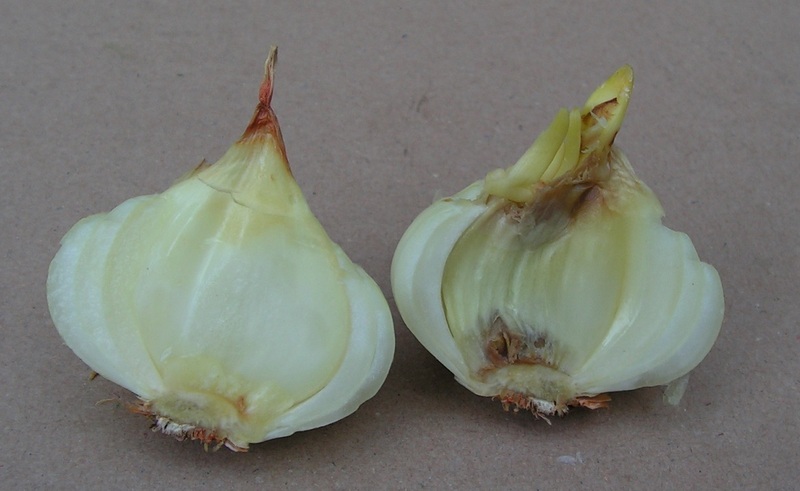 Leaves are still green, but waiting much longer can result in many rot onions. Lay the onions in low cardboard boxes with green leaves hanging over the edge. Place each box on a “plank bridge” and dry the onions in the sun or on a dry windy place. At tip “2) Simple tools and tips” there is a description of the plank bridge. Put a plank bridge on the floor and put a cardboard box on it. Fix a string around the box to prevent “expanding” of the side walls. Load the onions in the box and place a new plank bridge on it. The top box can be loaded to a higher level. Or you can stack the boxes in another way, as shown on the lowest photo above. When you lay the onions in the box like on the photo above, many onions fit in the box. And not too high stacked, only 1 layer. Let the onions dry in the boxes on a dry windy place. Store the whole in a dry cool place, like a cellar. Useful: You can cut a big part of the “almost dry” leaves. The onions end up with 0.5 to 1 inch of foliage. More onions will fit in a box. Onions dry better and there are less rot onions during storage. Check the onions regularly. Hold your nose close above the onions. Rotting onions stink. Or pinch in the onions. Rotting onions are soft. Transport the onions from the box to an empty box and check them. Remove bad onions. Or cut away the bad part of the onion. You can cut away the bad, rotten part of the onion. Then rinse the onion in streaming tap water. The “good” part of an onion after removal the bad, rotten part. Lay this onion on top of the box so it can dry. Use this onion first. At bad part of an onion can be removed using a sharp knife. Cut the onion in half ( in two). Remove the bad parts. This is the result of onion cutting and rinsing. When you need onions, use these parts first. 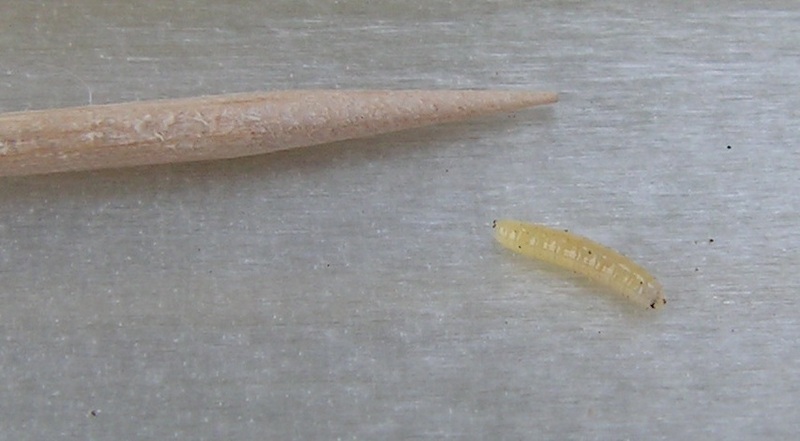 In a soft onion there can be brown pupae (onion fly), as shown on the photo above. Remove all parts of the onion. Put these onion parts in a garbage bin (not in your compost container). This photo shows the size of the pupae. About 6 mm (1/4 inch) long..
At this onion, a soft part has been cut away. After cutting, onions have dried in the open air for three weeks. 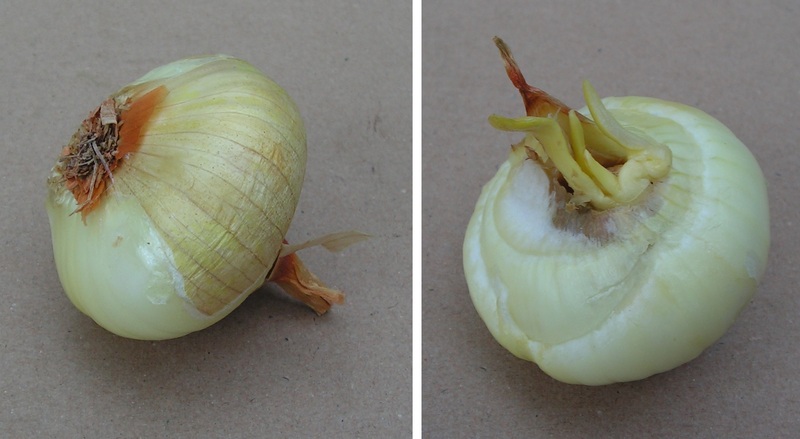 After removal the dry and green parts, the onion looks “normal” again and can be used in a meal. From march (late winter) on, onions can start sprouting. New green stems and leaves are growing at the onion. Carefully pinch in the “top of the onion”. When sprouting has started, you can feel the rigid new stem and leaves. Eat these onions at first. 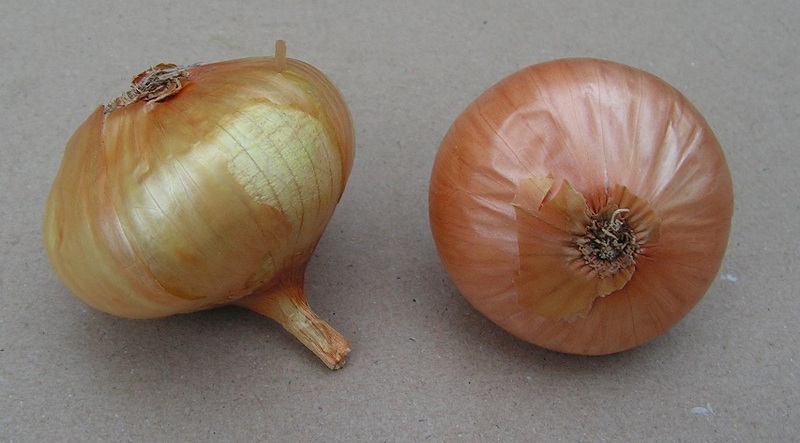 During storage, some onions can have wrinkled, loose outer skins. This means a new stem is growing in the onion. Use these onions within a few days or weeks for preparing a meal. This onion is the left one on the photo above. The outer skins have been removed. The onion has been cut in half. 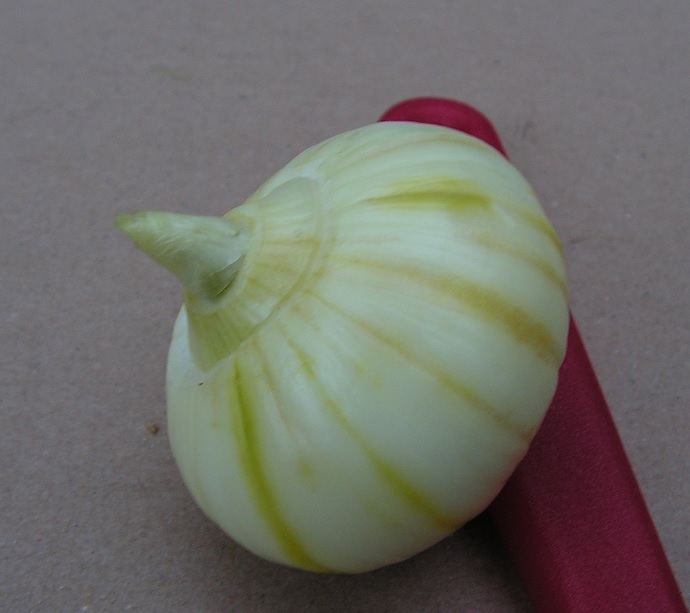 The right side part shows a new stem and brown coloured onion material. This onion is the right one on the photo above. The outer skins have been removed. A small piece of new stem is visible. Harvest the winter carrots in October November (mid autumn). There are 2 ways of storage described here. Both storage methods are in dry garden sand or in dry garden earth. Instead of garden sand or garden earth you can use masonry sand or sandbox sand. Put some dry garden earth or dry sand in a plastic box. Lay all carrots in the box. Don’t clean the carrots, but lay them in the box with adherent earth. “The dirtier the carrots, the better they can be stored”. Spread some dry garden earth or dry sand between and on the carrots. Put some dry garden earth or dry sand in a plastic box. Lay carrots in the box forming a layer. Don’t clean the carrots, but lay them in the box with adherent earth. “The dirtier the carrots, the better they can be stored”. Spread some dry garden earth or dry sand between and on the carrots. Lay more carrots in the box to form another layer. Spread some dry garden earth or dry sand on and between the carrots. Continue untill box is full or all carrots have been stored. Use dry sand or dry earth for this storage. When starting this storage the sand or earth may be a little moist and sticky. During storage the sand or the earth will dry out. When the sand or earth is too moist, the carrots can get rotting spots. See photos further at F4) . Put a lid on the box. The lid or the box should not close hermetically. The lid keep cats away (cats drop …….. in soft sand). Place the box with carrots in a cool, frost-proof room. Or outdoors at not freezing weather. Check carrots regularly. During this action lay checked carrots in another storage box with dry garden sand or dry garden earth. Use the sand from the “old” box in the “new” box. When the sand or the earth is very very dry, add some moist garden sand or some moist garden earth on top. Check for shoots and rotting. Remove the shoots (short leaves) from the carrots. And remove rotting parts. On this photo a carrot with dark coloured rotting material. Use a sharp knife to cut off the bad material together with some good material. 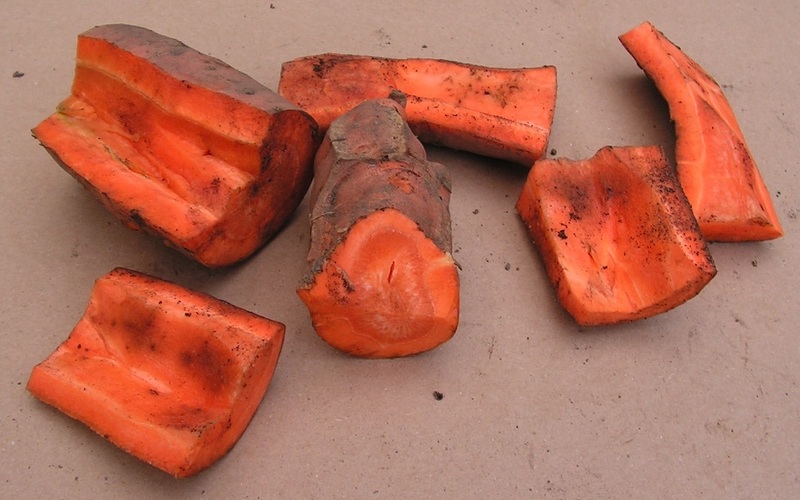 These pieces of carrot can be stored in dry garden sand or dry garden earth again. Consume these pieces at first. Before consumption, use a brush te remove the sand from the carrots. Winter carrots can have deep cracks. You don’t have to throw these carrots on the compost heap. Use a kitchen knife to cut the cracked carrot in good pieces. Prepare the pieces of winter carrot in the kitchen. Peppers can be stored on moist kitchen paper in a box with small air openings. So in moist air. Peppers can ripen in this box too. This procedure works extremely well. Now I know that storage and riping of sweet peppers goes well in a washing-up dish with plastic foil over it. But my first tests (about storage and ripening) were executed in a small greenhouse with transparent cover. Description of the first experiments below. Sweet peppers starting to change colour. Lay some sheets of kitchen paper in the tray of a small greenhouse. Spray water on the paper. Lay the sweet peppers on the moist paper. Put on the transparent cover with air openings maximal open. Put the whole in a room at about 18 C (about 64 F). During storage, transparent cover is on the tray. Same peppers after 4 days. On this photo many peppers have their stems “pointed down”. Same peppers after 7 days. On this photo too, many peppers have their stems pointed down. Further in this post there is mentioned that “stems pointed down” is not good. In this “down position”, stem and pepper can rot. Same peppers after 10 days. On these 2 photos, all sweet peppers have their stems pointing aside or up (because I turned the peppers). That is better because a pepper stem can rot when it is in contact with moist paper. The pepper right down on the photo was laying with its stem pointing down. The stem is rotting now. Same peppers after 14 days. Lay peppers on the moist paper with the stem pointing aside or up. Peppers do not rot so fast then. When the stem is in contact with moist paper, it can rot. See photos below. This pepper was on moist paper with its stem down for 7 days. Rotting has begun. During the next days of storage, the stem of the pepper was pointing up. Same pepper (with rotting stem) after 14 days. Stem has dried some more and is a little more brown. Pepper itself is whole and undamaged. You can use a washing-up bowl to ripen and to store sweet peppers. Put the peppers on moist kitchen paper. Cover the bowl with plastic foil, with 1 air opening. You can cut open a transparent plastic (freezer) bag and put the foil on the bowl. Use 4 clothes pegs to fasten the foil. At the top of this photo you see a narrow air opening. Close up of the air opening. One air opening is enough; air can pass and the moist paper does nor dry out too fast. Or use 3 clothes pegs to fix the foil; 2 (red) pins near the air opening and 1 (blue) pin at the other side. Three clothes peggs is useful for fast and easy opening and closing; remove the blue clothespin and flip the foil towards the opposite side of the bowl. When you want to store or ripen many peppers, you can use thin wooden laths to stack washing up bowls. On this photo there are 4 washing up bowls one on top of each other. On the 3 lower bowls there are 2 wooden supporting laths. 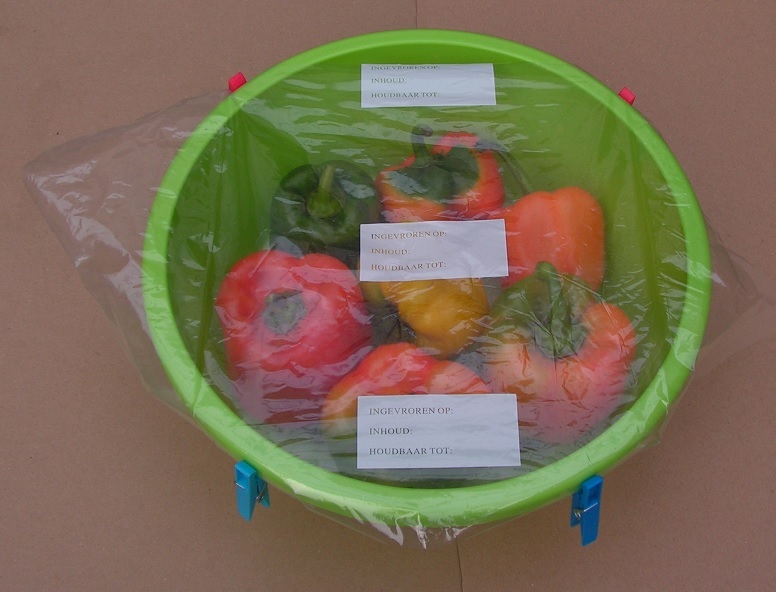 You can store or ripen many sweet peppers in a big cardboard box with plastic foil. Put a cardboard box in a big plastic bag. Lay some kitchen paper in the box. Spray tap water on the kitchen paper. Lay the peppers on the moist paper. Put a (folded) big plastic bag on the box. Fix it with clothes-pegs. This box can contain more than 35 bell peppers. On this photo another cardboard box with peppers. Plastic foil has been folded open. These peppers have been stored (ripened) for 4 weeks. Lay 3 or 4 layers of kitchen paper on each other. You can pour much tap water on the kitchen paper. The 3 or 4 layers of kitchen paper can absorb much water. The peppers lay on “very moist” paper. When you press with your finger on the paper, a little puddle of water is visible. That’s okay. The kitchen paper does not dry so fast; it keeps moist for 1 to 2 weeks. Store the peppers indoors at a temperature of about 15 to 20 C (59 to 68 F). Thanks to the very moist kitchen paper, the peppers stay robust. The peppers do not rot because the kitchen paper “holds” the water. And because storage temperature is not too high. In this way, peppers can ripen while they stay robust. After 1 to 2 weeks you have firm red (or yellow or orange or….) bell peppers. Check for rotting or soft peppers regularly (twice a week). There can be a small rotting spot on the pepper. At G3) you can read what to do with such a pepper. Check if the stem of the pepper is still “good”. When you can move the stem independently from the pepper, rotting can have begun. Soft peppers can be made robust again. See chapter G4). My experience: riping peppers stay well for over 14 days. Very few peppers rot. During riping you can add a banana or an apple, as advised on some internet sites. According to other sites, a banana or apple does not speed the riping. Without a banana or an apple, ripening goes well. The peppers on the photos above have been stored for 50 days (7 weeks): from November 10 until December 30. Afther this storage time, peppers have been used in a dish or have been frozen. During storage, a sweet pepper can start rotting. This can be near the stem of the pepper. At the pepper on the left side photo, the stem is brown. Cut away the stem. Then check if there are still brown spots on the pepper as visible on the right side photo. When brown spots are visble, cut away the bad material and some good material from the pepper. Lay the pepper in a tray on 2 layers of wet kitchen paper. For example in a package for mushrooms. Lay the pepper on the paper with the “cut away part” up, to overcome rotting. Put some plastic foil or a lid with holes on the tray. Put the whole in a refrigerator. Check regularly if paper is moist. When needed add some cold tap water. The pepper will not ripen, but it can be stored for some days in this way. When peppers are stored on moist paper for a long time (more than 2 or 3 weeks), some fruits can become soft. Or peppers were hanging on a broken branch of the pepper plant. These peppers are not rot but the skin is wrinkled or you can push in easily. The pepper has dried out. At a soft pepper, use a sharp knife to cut away the stem plus adjacent pepper material pepper. Then remove some ribs (membranes) and seeds. You don’t have to remove all seeds and all ribs. After this operation, a sweet pepper is called a “cut pepper” in this post. 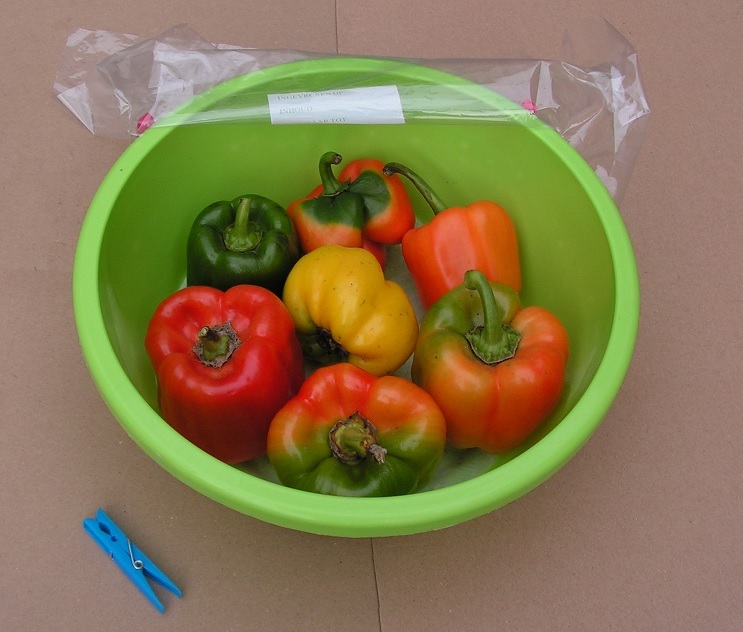 The soft peppers on next photos were stored in a washing-up bowl with moist paper and plastic foil coverage. Storage time was 26 days. Storage temperature was 64 F (18 C). Put all soft “cut peppers” in a plastic tray, all with the openings up. Put the peppers against the side edge of the tray or against other peppers to prevent toppling. Pour cold tap water in each pepper until full. That is easy done when using a watering can. On the photo above you see some peppers with seeds floating on the water. The plastic tray services as a drip tray and a support against toppling. Put the whole in a refrigerator. After 1 to 3 days in the refrigerator most or all peppers will be robust again. Then remove water from the peppers. When needed, cut a small (narrow) part of pepper material near the opening. Use the peppers in a dish or freeze them. Or store the peppers 1 or 2 days in a refrigerator in a tray with moist paper and lid, as described at G3) Rotting. During the “refrigerator time” you don’t have to refresh the water in the peppers. Check regularly (each 12 hours) if peppers get robust. Maximal time in the refrigerator is 3 days. When a pepper is not robust after 3 days, it will not get robust anymore. Use the robust parts of this pepper in a dish or freeze them. When there are only a few soft peppers, you can use a small (plastic) bowl. Water can leak out of a pepper into the tray. Then you see that the water level in the pepper decreases. Take that pepper out of the tray and immerse it in water as decribed below. Fill a beaker or so with cold tap water. Plunge the “cut pepper” completely in water and let the water flow into the pepper. After letting go (releasing) the pepper, a few millimeters (1/4 inch) of pepper will go above the water level. Put the beaker with water and pepper in a refrigerator. The soft pepper absorbs the water via the inner side. Immersion in water works as well as pouring water in a pepper. Use the method that suits you best. When freezing pepper pieces it is easy to use zip lock bags. After filling with pepper pieces, roll up the bag to remove much air from the bag. Then close the bag and unwind again. Distribute the pieces in the bag into a thin layer. Lay the bag in the freezer. Pepper pieces will freeze very fast thanks to the thin layer. You can easily see the contents of the freezing bags. When you want to freeze as little water as possible, do not rinse the pepper pieces before freezing. Wipe dry kitchen paper over the whole pepper to remove dirt or sand. Only when needed, rinse a whole pepper under a water tap to remove dirt and dry the pepper with a cotton cloth or kitchen paper. Cut the pepper in small parts. Lay the pepper pieces on a clean dry cotton cloth or kitchen paper and dry the pieces. Then put the dried pepper pieces in a zip lock bag. When there is mould on a peppers stem, use a sharp knife to remove the stem and extra pepper material. Put the pepper in a tray on moist absorbing paper. The pepper has its cutting surface pointed upward. Put the whole in a refrigerator as described at G3) Rotting. In a refrigerator, rotting stops or slows down. Attention: in a fridge, ripening stops too. When a bell pepper with mold on its stem continues ripening (in a tray, moist kitchenpaper, plastic foil on, 15 to 25 C, 59 to 77 F), pepper can start rotting. This yellow pepper has rotting material around its stem. At such a pepper, cut off its stem with much good pepper material. The lower part of the pepper (on the left side of the photo) is good. The hood and the seeds are rotting. G7) Tray with a straight edge. When using a bowl or tray with this type of edge the tray can be too low. When you put clothes pegs on the edge, the plastic foil touches the peppers. You can lay the plastic foil on the bowl in this way. Clothes-pegs hang at the side of the bowl and keep the plastic foil tense. Remove the foliage by turning it off from the beetroots. Fill a bucket or a plastic box with a thin layer of dry garden earth, dry garden sand, dry mansory sand or sandbox sand. Layer thickness about 1 to 2 inch. The earth or sand or may be a little moist. During storage the earth or sand will dry. Beetroots do not rot so easily. Lay beetroots in the bucket, forming a layer on the sand or earth. Then strew garden earth or sand between and on the layer of beetroots in the bucket. Lay beetroots on the sand or earth in the bucket forming a new layer. Then strew garden earth or sand between and on the layer of beetroots in the bucket. Continue this way of storage until the bucket or box is full or until there are no more beetroots. Always end with strewing a thin layer of earth or sand on the beetroots. Put the bucket or box in a cool and frost-proof room. Regularly check the beetroots and/or remove the new grown foliage or leaves. After checking, lay the beetroots in another box or bucket with a thin layer of earth or sand and make a new beetroot storage. Recycle the earth or sand. When the sand or earth is very dry, add some fresh moist earth or sand. In this way you can store the beetroots until next spring. You can harvest fresh leek during all winter when temperature does not drop too low. But at sharp frost, plants are hard to dig out of the soil. And the leaves of the leeks can get soft. When you put tunnels of transparent corrugated plate over the leeks in a row they are easier to harvest at freezing weather. See below. 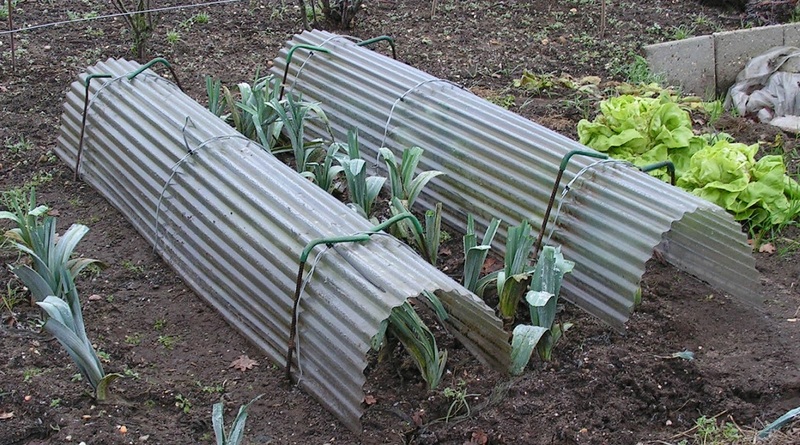 Put 1 tunnel over each row of trimmed leek plants (at the photo above I had 3 rows of leeks and only 2 tunnels). Each tunnel is open at both ends. The tunnel is very airy and leeks can dry up fast (from dew drops). So less risk of rotting leeks. Leeks under a tunnel stay in good shape. There is no snow on the leeks. (after snow on the leeks, the leaves get soft and start rotting). At freezing weather, digging leeks that were under the tunnel is easier. Sometimes the tunnel has been frozen to the garden soil. Then you have to loosen it before harvesting the leeks. Harvested leeks on March 16. These leeks have been stored under a tunnel in the garden soil during the winter. On March 16 (end of winter) the leeks have been digged up. The photo shows that the leaves of the leeks have grown longer during storage under the tunnel; the leaves “pushed” against the inner wall of the tunnel. You can dig leeks in early winter or “before a frost period”. Store the leeks (in groups) in the garden soil and cover the leeks. Or take the leeks home and store them in big flower pots or in buckets filled with a layer of garden soil. These methods are described below. A big plastic flower pot or a masonry bucket with holes in the bottom. Lay the flower pot or bucket at its side. Put a brick or something like that under the edge of the pot or bucket. Strew some garden earth in the pot or bucket. The slanting position of the flower pot helps to keep the garden earth in the pot during the next steps. Lay one layer of leeks on the garden earth in the pot. The leeks have shortened leaves. That is handy when putting the leeks in the pot. And less chance of rotting leaves during storage. Strew another layer of moist garden earth on the leeks in the pot. Put another layer of leeks on the earth in the pot. Continue these steps until the pot is “full” (or until there are no more leeks left). Put the pot or bucket with leeeks and garden earth straight (upright). Shake the pot or bucket to level the earth in the pot. On this photo you see 1 mortar bucket and 2 big flower pots with garden earth and leeks. All containers have holes in the bottom. All leeks have been put in at November 9. Put the pots with leeks under a roof or under a garden table during a rain period. Put the pots in a frost proof barn or a garage during freezing weather. Put the pots out when not freezing anymore. Regularly pour tap water on the earth in the pots. Do not pour water on the leeks. 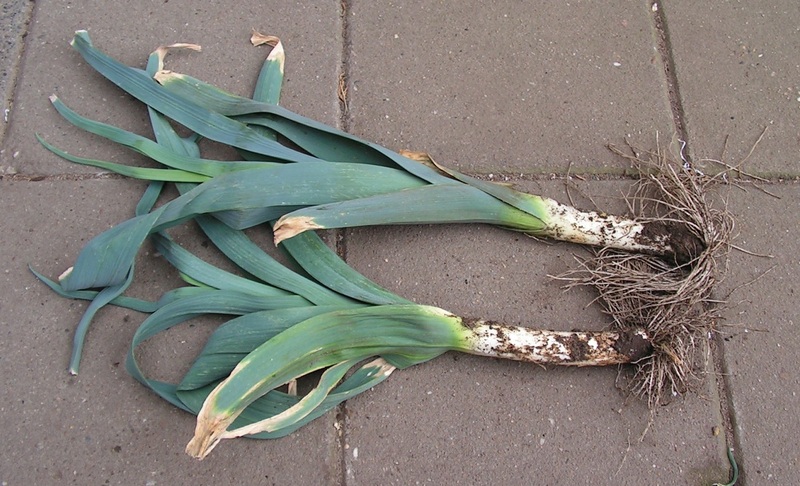 Water on the leaves can cause rotting leeks. This procedure is very easy and simple. The stored leeks at January 1. Stored leeks at February 1. At the end of February, the leeks in the pot looks like this. This is 16 weeks after putting the leeks in. The garden earth in the bucket is still a little moist. The outer leaves are dried out and brown. Three leeks taken out of the bucket. Outer leaves are brown. There are no (white) new roots visible. After removal of the outer leaves, the leeks look rather well. The leeks are “very dry”. The white leaves are rather “loose”. The 3 leeks have been washed and sliced. Leek slices of the 3 leeks. Look good and tasted well. Cut all roots before storing. When laying leeks in the pot or in the bucket, strew compost on the lower part (the short roots) and garden soil on the stems. Put the pot or bucket in the rain more often, and/or add more water to the soil. Below the original leek storage tekst of 2011. Cut the top part of the leaves. Remove the outer leaves. Use scissors to cut the roots to about 1 inch (2.5 cm) of length. The photo above shows a leek that can be stored. Fill a big flower pot or circular morter bucket (with holes in the bottom) with garden earth. Garden earth should be a little moist. Layer thickness about 6 inch (15 cm). Use a trowel to put the thickest leeks in the soil layer, against the edge of the flower pot. Do not put in all leeks but keep a clear space of 8 inch (20 cm). Then put thinner leeks in the soil. Use a spoon or so to make the holes and to shove the earth against the leeks. Put more leeks in the soil. At the end, put some thick leeks in the soil near the edge of the flower pot. When using a “weeding trowel” it is very easy to make the holes in the soil and to put in the leeks. See photos above. You can store leeks in a (big) bucket with a layer of garden earth. Put the flower pot or bucket with leeks under a roof or in a barn at sharp freezing weather. Water the garden soil in the pot or bucket regularly. You can store leeks with shrtd leaves and roots in a flowerpot filled with a layer of compost. Leeks in a flowerpot filled with compost. After some weeks of storage, leek plants have extra small white roots. Closeup of new small white roots. Perhaps storage in compost is better than in garden earth. Will be continued. 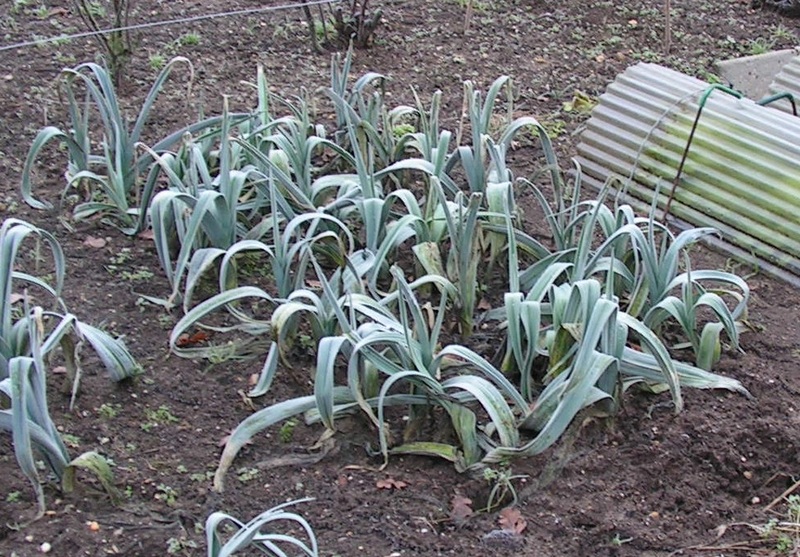 You can put leek plants in the garden soil and cover them against cold and freezing weather. Remove some foliage from the plants. Then put all leek plants (with roots) in groups in the soil of th (backyard) garden. Three ways of storage are described. For each way of storage: Cover the plants at heavy rain or night frost. Cover the plants with straw (around and on top) at sharp frost. I2)a Under a circular mortar bucket. Dig a round pit in the soil. Use an empty mortar bucket. Press on the earth with a rake. Put rows of leek plants vertically in the pit. Use a plastic plate or so to press the ground against the leek “stems” and to form a new space to put leeks in. Put the mortar bucket upside down on 3 bricks over the leeks. Fix the barrel with pens or a paving stone. Dig a rectangular pit in the soil. Put in a row of leek plants and shift earth against the leek “stems”. Put the leeks vertically in the pit. Or push the rows of leeks vertical after putting in. Put boxes upside down on bricks over the leeks. Fix the boxes with a paving stone. Dig a rectangular pit in the ground with one slanting side. Make a row of leeks against the slanting side, strew ground against the stems and press the earth against them with a spade or so. Repeat these actions. Lengthen the pit when needed to store all leeks. Cover the pit with a bended currigated plate. You can fix the plate using bricks, beams and (bamboo) sticks as shown on the top 2 photos. Put extra sticks in the ground when stormy weather is expected. When you made the greenhouse of transparant currigated plate (tip 13), place it over the leeks as shown on the last 3 photos. Four handles of iron pens are put in the “innerside eyes” of the iron wire. And four pens in the “outherside eyes”. In this way the storage is “airy” and the tunnel will not be blown away at stormy weather. The tunnel can be kept above the leeks all storage time. There is enough ventilation to keep the leeks fresh and good. Cover the tunnel with a tarpaulin at sharp frost or snow. Fix the tarpaulin with some bricks. On the photos above (end winter, February 18) you see leek under a tunnel. During sharp freezing weather there was a plastic foil and sailcloth over the tunnel. 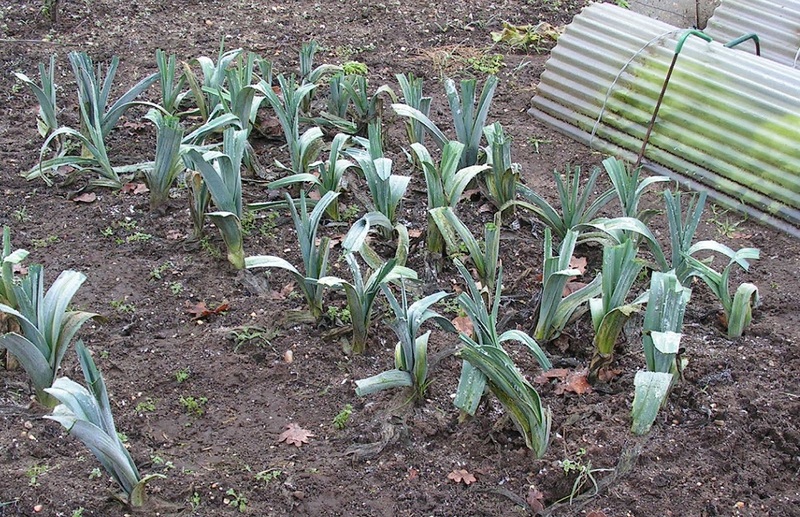 On this photo leek plants in the allotment garden soil of a colleague gardner (also end winter, February 18). Remove the corrugated plate at end of February or beginning of March. Otherwise leek plants get flower stems due to high day temperatures. Before your own harvest you can buy leeks in a grocery shop. When too many leeks bought, you can store them in your garden. Two “grocery leeks”and a plastic tube. The tube has a rubber band at about 15 cm (6 inch) from the end. Push the plastic tube in the garden soil (until rubber band touches the soil). Take the tube out of the soil and put the leek in the hole. Water the leeks in the holes. After some days the leeks will have new small roots. Leeks can be stored for about 1 week. Leek can contain pupae of the leek miner flie. More info in tip 4) Insects and diseases of plants chapter B)# Leek . To prepare leek with pupae in the kitchen you better find and remove these pupae. Two descriptions below. Remove the outer leaves and cut the leek into (4) big parts. On this photo you see the ends of 2 parts of leek. Before cutting, these pieces were connected. At each end there are red/brown discolourations. These are due to eating by the miner fly maggot. Use a sharp knife to remove some (1 or 2) outer leaves. In this way you remove the pupa and the red/brown discolourations. The same actions at this part of the leek. In the other part of the leek (3rd from below) there were no “miner tracks” visible. So no action needed. Rinse the leek parts in cold tap water. Then chop the leek parts. Rinse the slices in a bowl with cold tap water. Leek parts float in water. Pupae (still possible present) go down in water. Scoop the leek parts up out of the water. 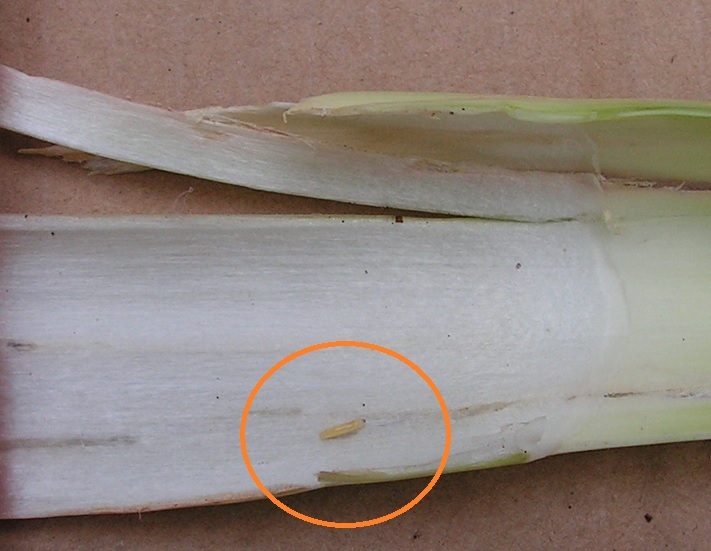 Pupae of the Leaf miner fly are in the outer leaves of the leeks. At the inner leaves, there are no pupae. 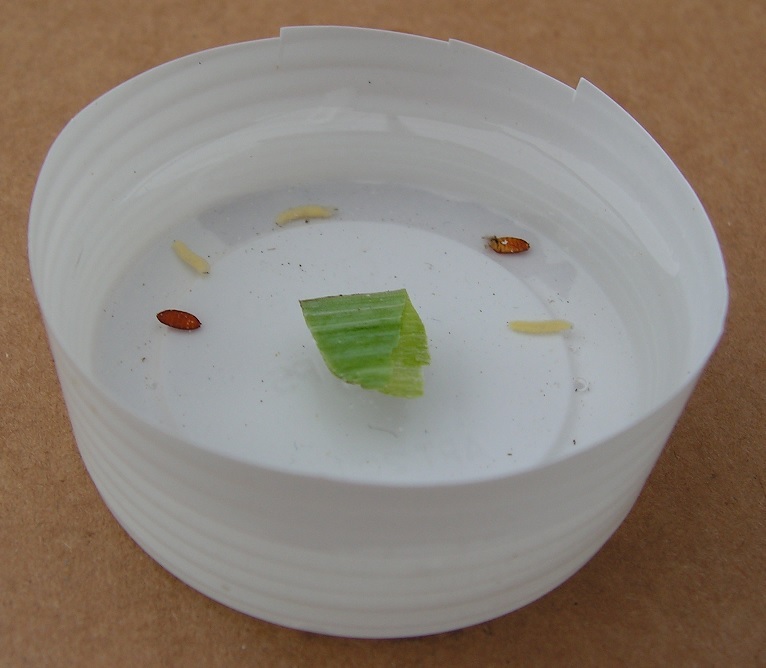 To find the pupae, you can strip the outer leaves of the leek and remove the pupae. Use a sharp knife to cut open the outer (4) leaves of a leek. Take the leafs from the leek and and open them on a cutting board. Remove the maggots and/of pupae from the leaves. Turn each leaf over to remove leaf miner “bugs” at the other side. The photo above shows 4 (folded open) leek leaves. At the bottom of the photo you see the middle part of the leek, after removing the outer leaves. On the leek leaves there can be maggots of the leaf miner fly. Remove them too. You can “fix” (repair) the leek; put the 4 leaves over the leek again. 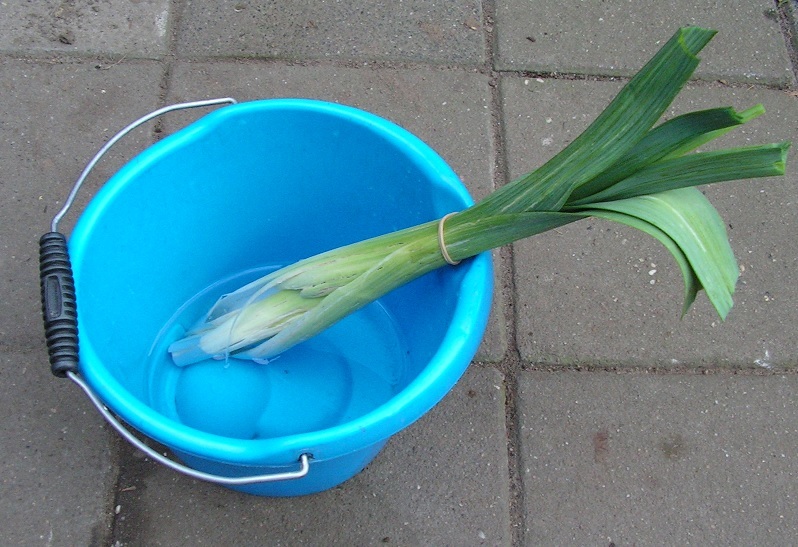 Store the leek in water (temporarely). Slice the leek and rinse in cold water. Maggots and pupae usually sink in cold water (although I found later that pupae can float in or on water too). Below there are photos of leek, that was stored until February 1 (mid winter). From the leek plants in the flowerpot, this amount of leek slices are cut. Get the cabbage plants out of the soil before a frost period using a spade. Keep as much earth on the roots as possible. Put the plant in a big plastic flower pot. Fill up with garden earth. Tamp the earth in the pot. Dig a hole in the garden and put the flower pot + cabbage in it. Water the plant. Why in a big flower pot? In a flower pot you can easily transport the cabbage plant without risk of hanging or dying. Watering is easy in a flower pot. At cold freezing weather, put the pot + plant under a roof or in a barn. In this way the plant in the pot stays well and healty. You have a good harvest at all weather conditions. Just before heavy snow or sharp frost, take the pot out of the soil . When top layer of the soil has been frozen, lift the pot carefully using a spade and a brick or a paving stone (see photo above). Put the pot + plant under a roof or in a barn or garage or so. At better weather (no snow or no frost), put pot + cabbage in the hole in the garden again. Water the plant. When you need only a small amount of white cabbage you can do as follows. In autumn or winter, cut away half of the cabbage. Keep the rest of the plant with stem and roots in the soil (or flower pot). 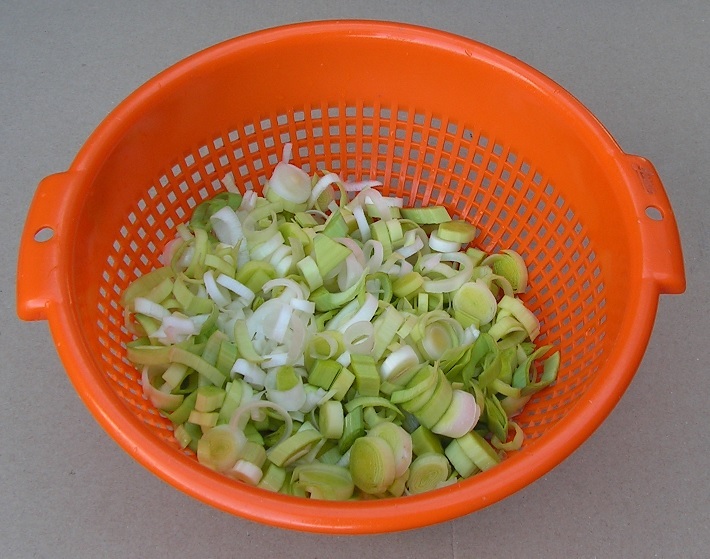 At January 20, half of a white cabbage was cut off (see photo above). During the sharp frost period the flower pot with the rest of the plant was kept in a barn at 1 to 5 C (34 to 41 F). At February 10, three weeks later, the “rest” was harvested. Quality was good. Probably this will also work at savoy cabbage or red cabbage. In winter you can store a half or a 1/4 white cabbage. In spring (April) new stems and shoots with leaves appear between the original leaves, as shown on the photo above. Then you better not use the cabbage anymore in a meal. Then remove all leaves and shoots and put them in a compost container. Put the cabbage stalk in a garbage bin. In summer or early autumn this storage trick results in something complete different. At this cabbage plant, half was cut away in end summer (September). During weeks and months thereafter, “mini cabbages” have grown. These can be used in a meal. The big leaves of the original cabbage are bad and show some rotting. So not usable anymore. Get the curly kale plants out of the soil before a frost period using a spade. Keep as much earth on the roots as possible. Put the plant in a big plastic flower pot. Fill up with garden earth. Tamp the earth in the pot. Dig a hole in the garden and put the flower pot + cabbage in it. Water the plant. Just before heavy snow or sharp frost, take the pot out of the soil . When top layer of the soil has been frozen, lift the pot carefully using a spade and a brick or a paving stone as mentioned at 10) White cabbage. Put the pot + plant under a roof or in a barn or garage or so. You can give a flower pot with a curly kale to a neighbour (friend, relative). Put the pot with plant on a balkony, pavement or garden soil. Have the plant watered regularly. Put the plant under a roof at freezing weather. Your neighbour (friend, relative) can harvest fresh curly kale when desired. You can take big curly kale plants out of the garden soil before a freezing weather period. Put the plants with big root balls in a big flower pot or mortar bucket with holes in the bottom. Put some more garden earth on the root balls. In this way you can store the curly kale plants for some weeks in a backyard garden. And harvest them when desired. 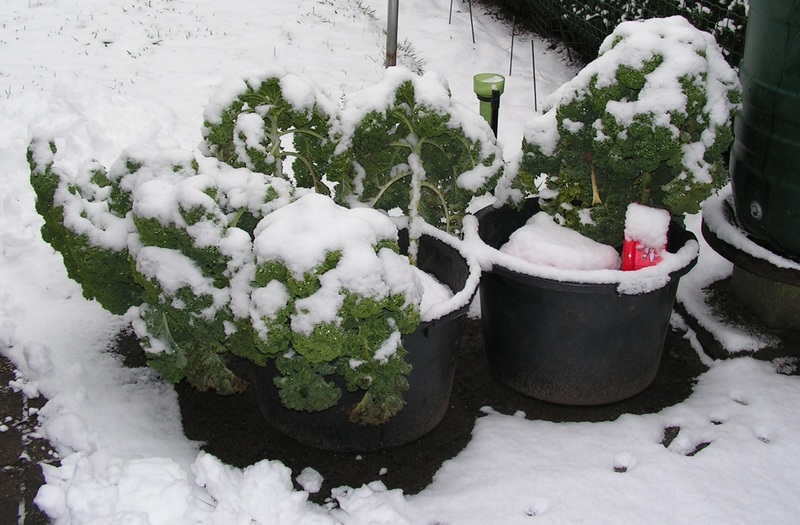 Put the pot or bucket with kales in a frostproof room when heavy frost is forecasted. At non freezing weather the pot can be in the open air. Also during rain. In October or November there can be freezing weather. The inner leaves of endive can get brown and soft then. It is better to take the plants out of the garden before a freezing period. Put each plant in a plastic flower pot. Fill the room around the roots with garden earth. Put the pots with plants on your balcony or pavement outdoors. Water the plants regularly or put them in the rain. Before strong freezing period put the pots under a roof or in a barn. In this way you can store endive for some weeks. You can plant (or keep) the endive plants in the garden soil. When (night) frost is forecasted, put a transparent tunnel over the plants. Remove the tunnel at non freezing weather. This storage method has been tested in November 2016. The endive plant in the middle on the lower photo looks well and healthy after storage. The 2 outer plants have brown spots on some leaves. At tip 24) Growing chicory you can read how to spread the witloof harvest. Did you harvest (too) many heads, you can store them easily. Take the the “vegetable tray” out of the refrigerator and lay the heads in. Put 1 or 2 layers of kitchen paper on the heads. Spray cold tap water on the kitchen paper. Then put the tray back in the refrigerator. Spray cold water on the kitchen paper when paper is dry. Storage time is minimal 1 week. On the photos above you see 2 witloof heads that were stored in the vegetable tray of a fridge for 2 weeks. One week covered with moist kitchen paper. Next week folded (wrapped) in moist kitchenpaper. After 2 weeks of storage, the heads had a few leaves with brown spots. After removal the brown spotted leaves, the witloof heads have been used in a dish. Witloof tasted well. So witloof can be stored for 1 to 2 weeks in a fridge under (wrappd in) moist kitchen paper. Tomatoes can be stored on 2 layers of moist kitchen paper in a tray. Put a plastic bag over the tray. Two rubber bands fix the plastic on the tray. Between the the plastic bag and the edge of the tray there must be a narrow air opening. Put the whole in a refrigerator. On many sites you can read that a fridge is too cold for storing tomatoes. I did a test with tomatoes on moist paper in a refrigerator. See results at chapter N1) Remarks . Do not store tomatoes on moist paper at temperatures higher than 15 C (59 F). Some tomatoes will rot within 1 week (my experience). Remove the stem and small leaves before storage. Lay the tomatoes with the “belly button” (position of the stem) upwards on the moist kitchen paper. With the belly button downwards on the paper, the tomato can break open. See photos above. Two tomatoes (top right and mid left) have cracks. These 2 tomatoes have been taken out of the tray. Put plastic foil on and put the tray with tomatoes in the fridge. These tomatoes have been stored in a fridge as described above. Storage time is 12 days. There are no rotten tomatoes and all fruits are firm. Many tomatoes have small brown spots. Some have a small burst in the skin. Before use, put the tray with tomatoes at room temperature for 2 days. After this storage, tomatoes look normal. And they taste somewhat worse than fresh homegrown tomatoes. They taste like tomatoes from a grocery shop. On the internet there are many sites about storing tomatoes. For example here . Ripening tomatoes while still hanging on the plant, see video tomato plant . Ripening tomatoes wrapped in pieces of newspapers, see video newspapers . Ripening in a cardboard box, to be seen on the video cardboard box only . The most simple procedure is with the cardboard box only. An improvement of this method is to be found on a video on this Belgian site . That Belgian video led to the simple ripening procedure as described below. Lay green and half ripe and almost ripe tomatoes in a cardboard box together with one riping apple. You may keep the tomatoes fixed to their stem or have the tomatoes apart. You don’t have to remove the green “crowns” from the tomatoes. See photo above. Lay a newspaper on the box. Put the box in a room at about 18 C (64 F). Keep the newspaper on the box during the ripening time. The apple produces a ripening gas. The newspaper holds this ripening gas (more or less) in the box. So ripening of tomatoes is faster. After one week of ripening, remove the newpaper from the box. Many green and half ripe tomatoes have turned into red during this week. These tomatoes have ripened within 1 week. Weight 1100 grams. Almost all tomatoes are undamaged and intact. Only a few tomatoes have “spots”. Cut off the bad parts of these tomatoes. These tomatoes may ripen for one more week. After a week of ripening, almost all tomatoes have coloured to red. Two small green tomatoes can be put in a compost container. The latest harvested (and ripened) tomatoes do not taste as sweet as sun ripened midsummer tomatoes. They taste more or less like “grocery store tomatoes”. You better use these tomatoes to make a tasteful soup. Below a recipe of a thick tomato soup filled with slices of leek, pieces of tomato and cubes of celeriac. Here is the recipe for the soup. Put all tomato pieces in a big cooking pan, but hold back the pieces of 2 tomatoes. At this soup there is no water added. All skins and seeds of the tomatoes are in the soup. When desired, you can cool down the soup, pour it in freezing boxes and put the boxes in a freezer. This soup is thick, filled and tasty. With many fibres. No salt or Maggi sauce needed. What about growing garlic. What kind is best. How deep do you put them in. I always put mine in the fall. Do you have any info on that? Sorry I don’t grow garlic in my garden. Information can be found on the internet. This is extremely thorough. Thanks for all the effort that went into it. Instead of trying to preserve end of harvest produce, or extra produce any time of the season, I encourage gardeners at our community garden to donate it to a local pantry – those in need almost never get fresh veggies, and I’m told they are thrilled to get it. That is a good action. At our allotment garden, gardners can donate their excess products to a food bank.